England's far right movement seems to have stalled lately, at least politically - but don't let that fool you. The rising tide of the far right movement in England is beginning to dominate British politics - Brexit is all the proof you need. At the 2016 Brexit referendum - 53.4% of English voters voted to leave the European Union. 52.5% of Wales voted to leave. In Northern Ireland, only 44.2% voted leave, and in Scotland, only 38% voted leave. A recent study in the UK has shown that Englishness makes you more likely to be racist. One side of my family is from Yorkshire, and I can confirm having spent time down there, that England does in fact have a serious problem with racism. Stephen Yaxley-Lennon AKA Tommy Robinson, has become the face of England's populist fascism. Robinson has recently been recruited into UKIP - the political party seen as responsible for causing Brexit. However, since his recruitment into the party, UKIP politicians have been leaving the party in their droves. Former party leader Nigel Farage, former leader Paul Nuttall, former leadership candidate Suzanne Evans, MEP Patrick O'Flynn, Scottish leader David Coburn and Welsh MEP Nathan Gill have all left the party in recent times and have blamed party leader Gerard Batten for associating itself with the likes of Robinson and his supporters. Now of course, the irony of UKIP politicians complaining that their party has become too extreme is quite amusing. Farage said recently, that if Brexit wasn't delivered, he would "don khaki, pick up a rifle and head for the front lines" so it's a bit rich coming from him that the party has become a tad extreme. And Scottish MEP David Coburn once compared SNP justice minister Humza Yousef to convicted terrorist Abu Hamza - simply because he is Muslim. So the party that has modeled itself on being anti immigrant and anti Islam, is now complaining that they have become too anti Islam by recruiting Tommy Robinson? Right. Sure. Now UKIP only got 1.8% of the vote at the snap election in the UK, but they only received 0.2% of the vote in Scotland. But at the snap election, both Labour and the Tories promised to deliver Brexit and end free movement - effectively killing off any chance for UKIP to eat into the establishment vote. At the 2015 General Election, UKIP received 12.6% of the UK wide vote and a massive 3.8 million votes, but only 1.6% of the vote in Scotland and just 47,000 votes. So why did UKIP lose so many votes at the snap election? Well of course, UKIP would appear to have achieved their main policy of taking the UK out of the European Union, and with both Labour and the Tories committing to end free movement, the UKIP vote appears to have been split to benefit both establishment parties. But don't be fooled if you think UKIP are finished. UKIP's lean further to the right in recent months has seen a surge in membership figures. The Britain First crowd, the English Defence League types and the National Front folks now have somewhere to go. There is also the chance now emerging that the UK will end up staying in the single market - there are murmurs of delivering something along the lines of 'the Norway model' or 'Brexit lite' as I like to call it, and that means keeping freedom of movement. If that happens, that's when the likes of UKIP will once again have the opportunity to rise. Now the question is, where do all the ex UKIP leaders and MEPs go from here? Do they aim to create a new party that can be a little bit more subtle about their racism and hatred of immigrants? Probably. Ironically it's the UK's obsession with austerity and inflicting extreme poverty on great sections of society that has probably caused this surge to the right. Austerity generally leads to extreme political movements coming to the fore. It has been noted by the UN that poverty and racism are linked. So the big danger in a post Brexit scenario, is that the potential financial crash that's just around the corner could actually invigorate the far right movements in England, who will benefit from the votes of the working class people who are squeezed further and further into poverty. Theresa May and Jeremy Corbyn, far from alienating the far right, have embraced the movement for political gain. They constantly repeat the mantra "we'll end free movement for once and for all" - in a blatant attempt to appease the millions of racists in England who see Brexit as an opportunity to rid the country of immigrants. UKIP attempted to play the clever game of pretending not to be racist, while promoting their racist policies, and so gave the more moderate racists a place to vote. However the lean to the right with the inclusion of Robinson and his supporters has of course made this racism more blatant. Robinson's supporters regularly perform the Nazi salute at his rallies. The ones we should really be looking out for right now, are not Robinson and his cronies - they will always appear too extreme to be taken seriously. 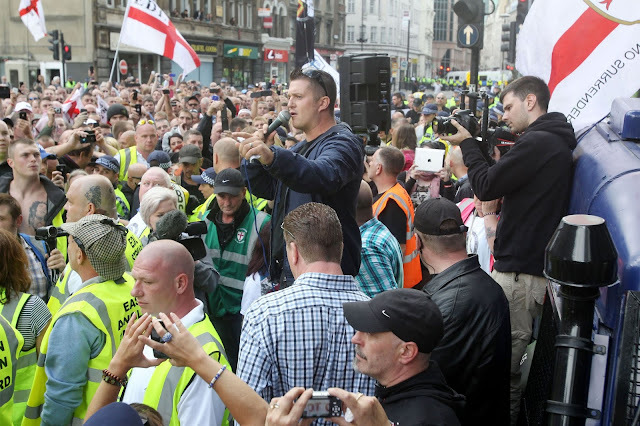 The vast majority of England's racists will never attend a Tommy Robinson rally and will never raise a Nazi salute. No, the ones we have to keep an eye on are the likes of Nigel Farage and Paul Nuttall - they are the ones who represent England's more down played racist under current - the millions of English who utter phrases such as "I'm not racist but..."
Where they go from here is anybody's guess, but I'll make that prediction right now - it will be another party modeling itself on UKIP - and will no doubt be called something similar, such as 'leave means leave' or 'Brexit means Brexit' or something silly like that. The English establishment are terrified of the far right movement gaining ground - which is exactly why they have attempted to appease the growing anti immigrant movement rather than fight it and maintain the moral high ground. Theresa May and Jeremy Corbyn are both very aware that if they alienate this significant share of the vote, it could make or break their chances of becoming the largest party at the next election. Should Brexit be stopped, or should a Brexit lite be delivered - which doesn't end free movement - the far right will abandon the establishment parties once again in their millions. The establishment are well aware that these movements, once they gain momentum, can achieve great results in elections. Many European countries are currently battling against similar movements. Of course none of this helps Scotland. Brexit is bad for Scotland in every way shape and form. The single, most harmful element of Brexit to Scotland is of course the ending of freedom of movement, which will harm the Scottish economy massively. Scotland has struggled to maintain it's small population, never mind achieve growth. Our population has hardly grown in 100 years, where as the population of independent Ireland has doubled during the same period. Scotland's only route out of this mess, it would appear, is to separate itself from England altogether by dissolving the Act of Union at the first available opportunity. This is England's problem, not ours - but for as long as we remain tied to the union, sadly, our country will be bogged down in England's mess, and the British establishment's struggle to fight against the far right. If I were to highlight three words to sum up how Scotland can escape from the political chaos that is modern Britain, those three words would simply be - independence, independence, independence.